I never planned to make this dish, nor did I crave gizzards. It was a sudden instinct. It happened last weekend when my husband and I were at the Farmers' market, a lady beside me at the poultry booth grabbed a bag of gizzards whose face showed tremendous excitement. It looked to me that she was trying to tell us those gizzards were good. That's how it got us into this purchase. I had gizzards before, and I knew that gizzards have some rubbery parts which may affect the turnout if we don't cook them properly. I did a little research, and finally decided that I should remove all the tough parts just to be on the safe side. Since we also got some zucchini, I paired them together. So we had this dish at dinner time. It was surprisingly good. My husband already started munching the gizzards right after they were cooked. I hope you enjoy this recipe. Put the gizzards into the boiling water and cook for 15 minutes over medium heat. Remove gizzards from the water. Discard all the rubbery parts or save them to make broth. Dice them into cubes. Season with salt and pepper. Set aside. Place flour in a bowl. Put the diced gizzards into the flour and mix well. Heat 3 tablespoons of oil over medium heat. Place flour coated gizzards in the oil - shake out all the excess flour first. Add sliced garlic to the gizzards and saute both ingredients until golden brown. Add green onion to the ingredients. Toss a few times and remove from heat. Place the gizzards onto one side of a serving plate. Set aside. Put one tablespoon of oil in a pan over medium heat. Add zucchini to the oil and toss until brown and tender. 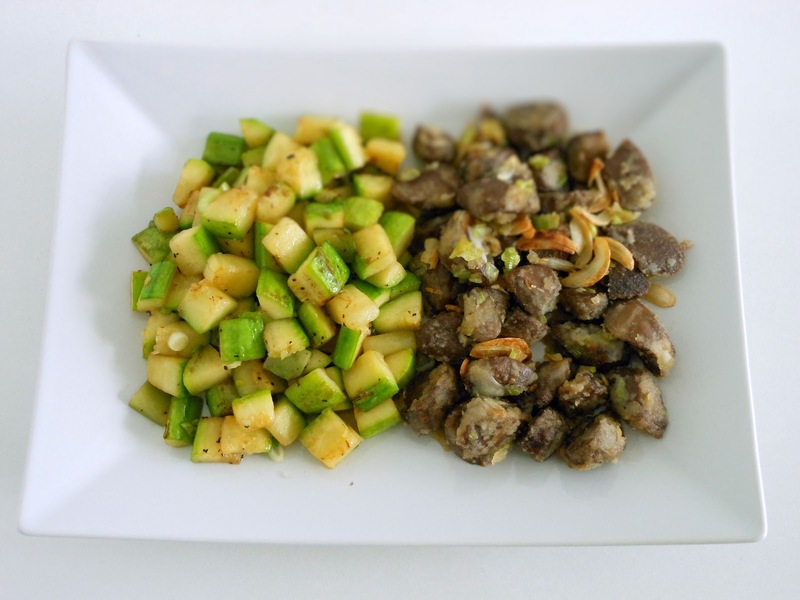 Place the zucchini beside gizzards. Makes two servings. Gizzards can be served with honey mustard sauce.